The new buzz word is metallic thread. So many of us want to add a little bling to our projects, and metallic thread is a wonderful way to do so. We are blessed to be living and creating in a time when the choices are so plentiful. 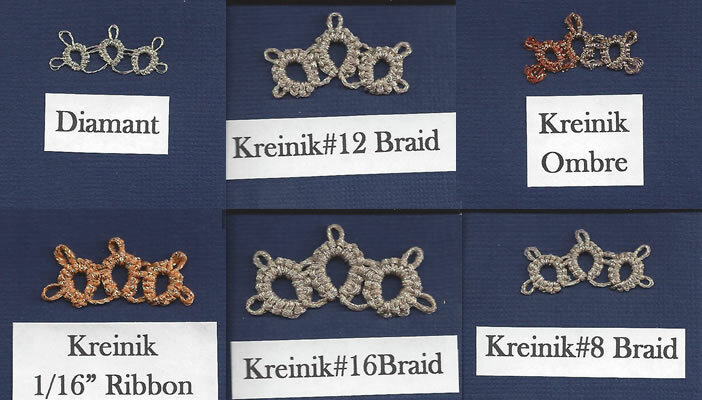 The biggest question is what size is metallic thread and how does it compare to Brand X Y or Z. Metallic threads are inherently fine threads and hopefully they have enough luster to last the wear and tear of either tatting or crochet or bobbin lace. Since threads are measured differently depending on brand, country and use, it makes it a little trickier to choose. Many times you can tell by looking at the strands, but most of the time you just have to get it in your hands and try them. Below are examples of different metallic threads. Personal preference is king. You have to try them to see what works best for your project and your tension. The traditional methods were to wrap the metallic with cotton or another natural fiber. Today with the advanced technology available, we can have straight metallics or ribbons and even Ombres which give us unlimited possibilities. The selections are growing, so have fun trying the colors and styles you like.